↑ 1.0 1.1 1.2 "André the Giant Profile". Online World of Wrestling. Archived from the original on September 21, 2008. สืบค้นเมื่อ September 22, 2008. 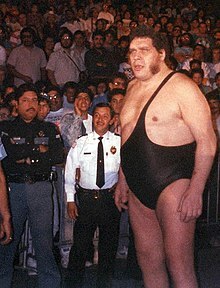 ↑ 2.0 2.1 2.2 "The Official Site of André the Giant: Biography". สืบค้นเมื่อ May 18, 2009. ↑ 3.0 3.1 Krugman 2009, p. 4. ↑ 4.0 4.1 4.2 Krugman 2009, p. 7. ↑ 5.0 5.1 5.2 "WrestleMania III – André the Giant vs. Hulk Hogan – WWE Championship". WWE. Archived from the original on January 16, 2006. สืบค้นเมื่อ February 15, 2011. It was billed as the biggest main event in the history of sports entertainment: Hollywood Hogan vs. Andre the Giant. Hogan, in his third year as WWE Champion, was set for the biggest challenge of his life in the form of the 7-foot-4, 520-pound Andre, who betrayed his former best friend in exchange for his long-awaited shot at the championship. ↑ Michael Krugman (24 November 2009). Andre the Giant: A Legendary Life. Simon and Schuster. p. 149. ISBN 978-1-4391-8813-2. ↑ "Andre the Giant". biography.com. A&E Television Networks, LLC. สืบค้นเมื่อ 11 September 2015. At his largest, Roussimoff was probably six feet eleven inches tall, though he was advertised as seven feet four inches. ↑ Tim Hornbaker (2012). Legends of Pro Wrestling: 150 Years of Headlocks, Body Slams, and Piledrivers. Skyhorse Publishing Inc. p. 197. ISBN 978-1-61321-075-8. ↑ "Andre the Giant: Bio". WWE. Archived from the original on May 1, 2009. สืบค้นเมื่อ 2 April 2011. ↑ "André the Giant official website". Archived from the original on July 4, 2007. สืบค้นเมื่อ July 8, 2007. ↑ 13.0 13.1 "IWA World Tag Team Title". Wrestling Titles. สืบค้นเมื่อ February 23, 2011. ↑ 14.0 14.1 "Andre the Giant's first reign". WWE. Archived from the original on June 24, 2005. สืบค้นเมื่อ February 15, 2011. ↑ 15.0 15.1 "Andre the Giant and Haku's first reign". WWE. Archived from the original on July 20, 2005. สืบค้นเมื่อ February 15, 2011. ↑ 16.0 16.1 "Andre the Giant: Bio". WWE. สืบค้นเมื่อ 2011-04-02. ↑ 17.0 17.1 Krugman 2009, p. 79. ↑ Kreikenbohm, Philip. "Real World Tag League 1991 « Tournaments Database « CAGEMATCH - The Internet Wrestling Database". www.cagematch.net. สืบค้นเมื่อ 2018-02-12. ↑ "NWA Florida Tag Team Title History". Solie's Wrestling Title Histories. สืบค้นเมื่อ February 18, 2011. ↑ Krugman 2009, p. 47. ↑ 21.0 21.1 "Pro Wrestling History". ↑ Kreikenbohm, Philip. "Sagawa Express Cup Tournament". Cagematch.net. ↑ "NWA United States Tag Team Title (Tri-State)". Wrestling Titles. สืบค้นเมื่อ February 24, 2011. ↑ Krugman 2009, p. 27. ↑ "Professional Wrestling Hall of Fame: Andre the Giant". Professional Wrestling Hall of Fame and Museum. Archived from the original on January 4, 2011. สืบค้นเมื่อ February 18, 2011. ↑ Krugman 2009, p. 24. ↑ "Pro Wrestling Illustrated Award Winners "Most Popular Wrestler of the Year"". Wrestling Information Archive. Archived from the original on April 15, 2008. สืบค้นเมื่อ March 21, 2011. ↑ Krugman 2009, p. 196. หน้านี้แก้ไขล่าสุดเมื่อวันที่ 20 กรกฎาคม 2561 เวลา 20:40 น.